I am so happy I purchased this. I truly loved your class. It was to the point and kept my interest. My newsletters have been a hit! I started them in January 2019 and am finding them very easy to create once I set up the template. I enjoy your ideas you post in the Facebook Mastermind Private Group too. All Very Good information. Thank you! → Stay Top Of Mind with your sphere & HAVE FUN DOING IT! And I show you exactly how to do this. How do you do all of the above AND continue to stay top of mind? How can you CONSISTENTLY get more leads and referrals without working so hard? How can you tell who in your sphere may be a ‘hot' seller or ‘hot' buyer? You don't…unless you have a a magic wand. When I started my real estate business I realized I only had so much time in a day. You hear over and over again…pick up the phone, make calls, get in front of people. BUT, I was only one person and I knew from a long background in sales and business building…this is, in large part, a numbers game. The more people you get in front of, the more people you can identify as buyers and sellers…the more people you can offer valuable information who see you as the go-to real estate professional…the more business you'll have. I didn't have a bottomless budget to purchase hundreds of cold leads monthly. Nor did I have the time to call all of them, over and over again until I made contact…not to mention the challenge of competing with other agents receiving the same leads! I created the ‘magic wand.' It's consistently brought me referrals, listings and buyers without spending thousands of dollars in marketing and endless hours on the phone making outbound calls. It's magic in that it allows me to leverage myself, identify hot prospects with the power of technology and reduce my manual workload by creating a SYSTEMATIC PROCESS which generates inbound calls, referrals and emails to me…to my business! This magic wand (a simple strategic newsletter) frees up my time so I enjoy a personal life…this method helps me leverage myself and work smarter…not harder. In my last Realtor Newsletter (E-Zine), within only 24 hours, I generated 8 CMA's, 6 people called to ask general real estate questions and 10 emails from my sphere asking more real estate questions…and received 2 referrals. FROM 1 NEWSLETTER. WITHIN 24 HOURS…Not to mention all the calls and emails from people calling to say “Hi” I LOVE IT…it's such a great way to connect with your sphere! Your own strategic newsletters will have a cumulative effect. You'll not only see an immediate impact after sending one…but you'll continue to remain in the minds of your sphere…and when your newsletter is done right…they'll see you as the only go-to real estate professional (for themselves and their family and friends). Do you want to know who may be READY TO LIST OR BUY SOON? In this course package I'll show how to set up your newsletter so you can see who! After showing them the home he said…”You know we've talked with several Realtors but haven't felt comfortable with any of them. I got your email today and WOW.” It was my E-Zine (Realtor Newsletter). I asked if they were working with an agent in helping them find their home and if they had signed a buyer's agreement with anyone and they hadn't. YET. They Did With Me. This Realtor Newsletter is POWERFUL…if done right. Every Realtor Should Have a Realtor E-Zine (STRATEGIC NEWSLETTER). 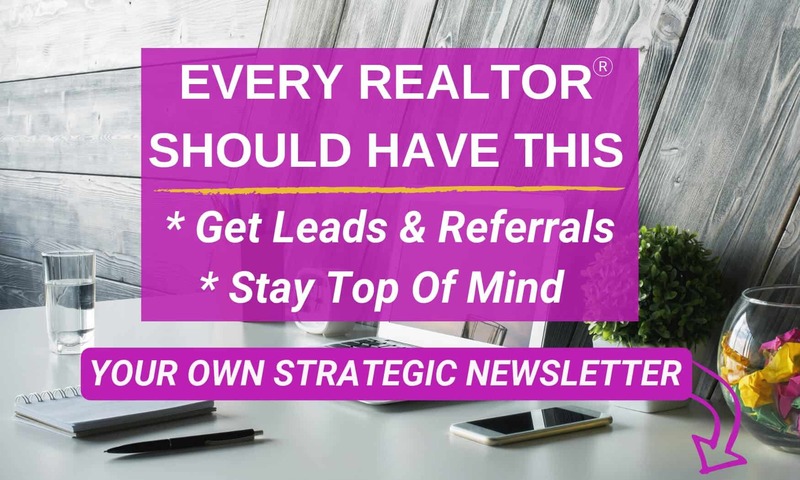 In this course I show you how to create a Realtor Newsletter that gets you leads, referrals and keeps you top of mind without spending thousands of dollars and a lot of time on it. * What you need to do after you hit send on your monthly newsletter to mine the gold in your subscriber list. By purchasing this course, you will receive access to the “Real Estate Spice Creating Realtor Newsletters” Facebook Mastermind group. This exclusive group will help you connect with others who have taken the course so that you can get feedback, ask questions, learn from others in your community, and offer help of your own. This adds, even more, value to the course. I want to help you with your real estate newsletter so that you can increase your referrals, your leads, your income, and so that you can help your SOI (sphere of influence), so what's better than this? Get help applying the techniques and receive support directly from me in the Exclusive Master Mind Facebook Group. Be the GO-TO real estate professional, generate leads and referrals and Let This Incredible ‘Magic Wand' Your Own Strategic Newsletter (Which You'll Learn How To Create)…WORK FOR YOU. This will pay you great dividends YEAR AFTER YEAR. What if I'm a brand new agent? Real Estate Spice: Creating Your Own Realtor Newsletter Course, is a great way tool to learn to build a database of leads and clients and let your SOI (sphere of influence) know you're a Realtor now. By taking this course, you'll start off in your new real estate business the right way. You'll establish yourself as the go-to real estate professional. You can learn from my years of marketing and newsletter mistakes and learn the best ways to create a professional Real Estate Newsletter that WORKS FOR YOU. Through taking this course you are sure to grow a profitable real estate business faster than the average agent, as you'll learn exactly what you need to know about strategic newsletter marketing. So, even if you just got your license (or soon will be), you are ready to get started with this course and receive support! What if I've been a Realtor/Broker for years? Strategic Newsletter Marketing is an area that even the most seasoned Realtors can improve upon. Plus, many Realtors aren't making anywhere near the amount of income they should be or are spending way too much time staying in front of their sphere and generating listing and buyer leads. If you want to leverage your time (and if you're a broker and want to help out your agents) this is a prime way to leverage yourself and establish your brokerage as THE LOCAL REAL ESTATE AUTHORITY. The course starts now! It is a completely self-paced online course – you decide when you start and when you finish. How does a lifetime access sound? After enrolling, you have unlimited access to the course for as long as you like – across any and all devices you own. Plus, this course won't always be offered at this price, as new strategies and information will continually be added. You won't have to pay a penny for any updates, though. Once you purchase, you will receive all updates free. Real Estate Spice: Creating Strategic Newsletters is a text and video based course that is taught through PDFs, tutorials, videos and helpful worksheets. When you register you will receive an enrollment email with your unique login information. This course is applicable to anyone in any country. You can use the strategies and tips in this course and apply it to any area in the world. If you don't see your question here, please send me an email at jaymie@realestatespice.com, and I will send you the information you need! Not Right Now. Take Me To The Home Page.